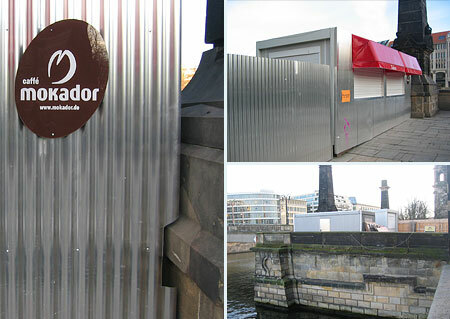 This cute little box is the ticket office of the outdoor cinema on Museums Island in Berlin. It’s been stood on the ramp to Friedrichsbrücke for ages, but I’ve just noticed how charming it is. This charm stems from the special mixture of fabulously unspectacular materials. It’s the cheap corrugated façade and the way it’s been cut to sit flush with the bridge’s stonework (1); it’s the cheesy, red, retractable hotdog-stand-style sun shade (2); it’s the brown Caffe Mokador sign affixed with rivets (3); it’s the orange A4 sheet with the opening times stuck up with sticky tape (4); and of course, it’s the obligatory addition of a half-arsed magenta-coloured graffito (5). Also of note is the missing sense of roofiness: the building just stops, as though someone lopped off the top with shears. Berlin’s ongoing dreams of granduer will always be at odds with the city’s true appeal: it’s well established sense of the provisional, the improvised and the makeshift.